This comprehensive approach provides practical exercises that will enrich and transform your work, whether you are looking for a story idea, lighting a set, editing a scene or selecting a music cue. Anthony Minghella, writer-director (The English Patient); Kimberly Peirce, writer-director (Boys Don't Cry); John Lasseter, writer-director-producer (Toy Story); John Wells, writer-producer (ER); Hanif Kureishi, writer (My Beautiful Laundrette); Pamela Douglas, writer (Between Mother and Daughter); Renee Tajima-Pe?a, director-producer (My America...or, Honk If You Love Buddha); Ismail Merchant, producer (The Remains of the Day); Jeannine Oppewall, production designer (L.A. Confidential); Conrad L. Hall, cinematographer (American Beauty); Kathy Baker, actor (Picket Fences); Walter Murch, sound designer-editor (Apocalypse Now); Lisa Fruchtman, editor (The Right Stuff); Kate Amend, editor (Into the Arms of Strangers); and James Newton Howard, composer (The Sixth Sense). This is a book about the creative process of filmmaking -- the mysterious transformation of mere glimmers of thought into coherent stories, characters, images and sounds. As filmmakers ourselves and as teachers of film and video production at the University of Southern California, we are passionate about films and fascinated by the challenges of making them well (we use the word "film" in this book to include all story-based moving image media). Inevitably, we have written a book shaped by our own tastes -- we're drawn to films that feel fresh, multilayered and authentic, that bear the distinct imprints of the people who made them, and that have a strong impact on audiences who see them. These are qualities that can be hard to pin down, but we sorely feel their absence in those films that seem to have come off an assembly line: hollow-feeling cut-and-paste pastiches of other movies and TV shows, filled with clichéd characters, cookie-cutter plots, hackneyed dialogue and imitative stylistic flourishes. We have written this book to be appropriate for those learning filmmaking on their own as well as for students in a production class or program. We teach in a film school and see its great value in providing structure, contact with diverse tastes and approaches, a collaborative environment, a wide range of hands-on experience, faculty mentoring and many other benefits. We're also aware that film school is not for everyone and that many outstanding filmmakers never went to film school, including a majority of those interviewed for this book. We have therefore tried to make this a resource that would be informative and inspiring, whether used by an individual reader or as an assigned text in a course. 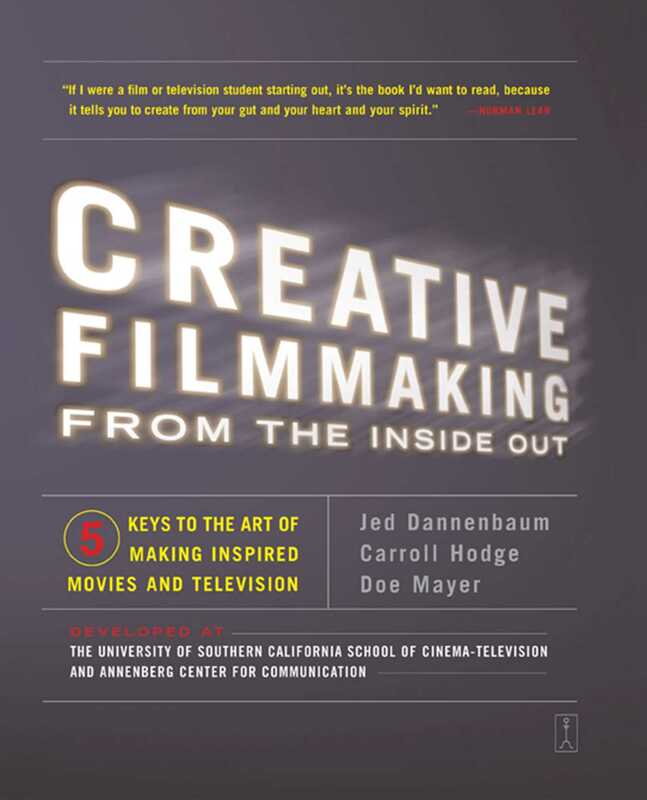 (Teachers using this book in classes and workshops, as well as individual readers, may wish to refer to our website, creativefilmmaking.com, for additional suggestions.) Although we designed the book with developing filmmakers foremost in mind, the aspects of creativity it highlights and clarifies are ones that even the most experienced professionals continue to explore throughout their careers. We wrote a book that we ourselves learned a great deal from, and we believe that it will have rewards for anyone working in the field. It's often said that no one sets out to make a bad film. So, assuming you share something of our taste and want to make films that are inspired, original and resonant, what's the foolproof, surefire formula for great filmmaking? Of course, there is no such thing. Paint-by-numbers formulas -- "put a plot point on page 'x' of the screenplay, use lens 'y' and camera move 'z' for shooting a certain kind of scene" -- cannot produce the kind of inventive, surprising filmmaking we admire. Doing good work is always a risky, unpredictable, paradoxical process even for the very best filmmakers. We used the word "mysterious" above to describe the creative process of filmmaking; so it is and so it shall remain. Yet what you can learn, and what we emphasize in this book, is how best to prepare yourself, and how to approach your work, so that your inherent creativity has the greatest opportunity to emerge and flourish. Creative Filmmaking from the Inside Out describes an approach that begins with preparation that is largely individual and internal -- recognizing and strengthening your own unique point of view. As you learn to rely on rather than suppress your passions, idiosyncrasies, intuitive responses, values and personal connections to the material, you will develop a more confident inner voice. You can then bring that clarity to your collaborations with fellow filmmakers, to interpreting the responses of audiences, and to wrestling with your responsibilities as a creator of powerful art, without losing your way or diluting the integrity of your intent. Whatever the results, you will have a much better internal gauge for assessing and learning from each experience as you move on to your next creative project. We have broken down the overall process described in Creative Filmmaking from the Inside Out into five chapters, each exploring one of what we call the "Five I's": Introspection, Inquiry, Intuition, Interaction and Impact. Although we had to put the chapters in a linear order, in reality the "Five I's" are all interwoven throughout the creative process. You might intersperse working from your own point of view (introspection) and brainstorming with a colleague (interaction). You may be in the middle of research (inquiry) and have a provocative dream (intuition). You may start with an idea of what a film is really about (impact), but find that your idea changes and develops throughout the filmmaking process. The book begins with Introspection, a consideration of how the act of looking within ourselves can help us draw on who we are and how we see the world. The chapter looks at how we might discover the specific kind of work we have a passion for and are particularly well-suited to do; the importance of seeking personal connections in the material we choose to work on; and how we can reference and draw on our own specific experiences, including the darker, more difficult aspects of our lives, weaving bits of ourselves into what we create in order to deepen our sense of connection and authorship. In addition to working from our own experience, we need as filmmakers to be able to draw on the entire spectrum of human thought and behavior, including those facets we have not yet directly encountered. In Inquiry, we see the importance of having a broad knowledge of the other arts and diverse fields of knowledge; the value of seeking direct firsthand experience of the world of a story; and the need for research, looking deeply into a subject, a setting, a culture, or an era in a way that enriches our understanding and point of view. Our strange, elusive communications with the nonconscious parts of our mind are often the most spontaneously creative. Intuition is neither guesswork nor supernatural insight -- it is dependable in proportion to the extent that we have prepared ourselves well through education, observation, research and life experience. We can strengthen our receptiveness to our nonconscious inventiveness by connecting more deeply to our ability to dream, daydream, and become lost in play. Intuitive creativity can even require that we turn our conscious attention entirely away from our work for a while, as part of a problem-solving process. Film is a profoundly collaborative art, and through Interaction we can draw effectively on the ideas and responses of others. Our filmmakers show how collaboration can be an open, fluid process that allows for the integration of many voices, with the director serving as the orchestrator of these varied contributions. When "creative differences" emerge, the resultant give-and-take can enhance rather than derail the process. Much of the success of interaction depends on establishing a genuinely open creative environment, insulated as much as possible from outside commercial forces. In the fifth chapter, we look at how we create films that have an Impact on an audience. We see how discovering the deeper layers of a film -- its "undercurrent" -- can guide us in making choices that give a film power, resonance and universality. We also see how filmmakers use test audiences as part of the creative process, gauging if a film is having its desired impact. Finally, we explore how the powerful effect of films on audiences also brings with it complex questions of responsibility for the images we create, leading us back to introspection. At the end of each chapter we include numerous practical yet playful Limbering Up explorations to stimulate and enhance creativity. These limberings are just that -- ways to loosen up and get your creative juices flowing. Most can be done in five minutes or less, and all are appropriate no matter what kind of work you are doing, anytime you want to get your head into a more innovative place. The structure of the Workout section at the end of the book, by contrast, follows the specific tasks and various stages of the production process, from originating ideas and writing ("Down on the Page"), through pre-production and production ("Into the Can"), and post-production and audience response ("Up on the Screen"). This final section gives you explorations of greater depth that will connect to any current film project you may be working on. Good filmmaking is passionate and risk-taking. Throughout this book, we encourage a certain level of conscious self-awareness and intentionality in filmmaking, but the probing and thoughtful explorations we describe are antithetical to approaches that over-systematize or over-intellectualize the essential emotionality and unpredictability of art. Intuitive leaps, serendipitous discoveries, continual exploration and surprise, and even long-after-the-fact realizations are all part of the mystery of the best creative work. The ultimate goal of this book is to help you attune your mind to the unexpected truths of your heart and gut. Our own understanding of this process has come from more than thirty-five years of collective experience as teachers and mentors for literally thousands of student productions, and is also grounded in our work as active professional filmmakers -- writers, producers, directors and editors of both fiction and documentary films. For this book, we sought to enlarge our perspective by going to the best sources possible: professional filmmakers whose work has been acclaimed for its originality and authenticity. We talked at length with fifteen outstanding filmmakers who have held key creative positions on some of the most beloved and highly regarded movies and television programs of our time: American Beauty, Apocalypse Now, Boys Don't Cry, The English Patient, ER, Into the Arms of Strangers, L.A. Confidential, Picket Fences, The Remains of the Day, The Right Stuff, The Sixth Sense, Toy Story, The West Wing and many others. Although these professionals had been interviewed many times before, we set out to get a different perspective, choosing not to cover such familiar ground as working with movie stars, the technology of special effects, or anecdotal production stories ("ten straight days of rain"). Instead, we asked them to focus on their own creative process, and to give us concrete examples of why they approached specific scenes, sequences, characters, locations, and visual, sound or music motifs in the way they did. Another way this book is unique is that everything in it is applicable to every creative role at every stage of the filmmaking process. We sought universal aspects of creativity that will be meaningful to you whether you are looking for a story idea, choosing a location, casting an actor, deciding where to place the camera, making an edit, or selecting a music cue. To achieve this level of universality, we interviewed a wide range of creators, both in terms of their professional position and their area of the industry. Writer Hanif Kureishi, writer-director Anthony Minghella, writer-director Kimberly Peirce, producer Ismail Merchant, production designer Jeannine Oppewall, cinematographer Conrad Hall, editor Lisa Fruchtman, sound designer and film editor Walter Murch and composer James Newton Howard have all worked primarily in live-action features, and writer-producer-director John Lasseter is known for feature animation. Writer-producer John Wells, writer Pamela Douglas, and actor Kathy Baker have worked extensively in television. Director-producer Renee Tajima-Peña and editor Kate Amend have specialized in documentary filmmaking. They are all introduced in The Filmmakers, and their major credits and awards are listed in Selected Filmographies. We also wanted to represent the continuing emergence of a greater diversity of filmmakers in terms of gender, ethnicity and sexual orientation (although the Hollywood studios are lagging badly in this regard), as well as include voices with a more international perspective. In addition to their remarkable range of background and experience, why did we choose this particular group of filmmakers? We believe they exemplify the honest and deep creativity we are attempting to describe and promote. And while there is no definitive measure of what constitutes "good" filmmaking -- tastes vary widely and also change over time -- we sought those who are widely acclaimed at the top of their professions, and whose work has been recognized by the major critics' associations, their respective guilds and the Television and Motion Picture Academies. As a group, they have won or been nominated for thirty-nine Oscars and twenty-seven Emmys. Finally, we looked for filmmakers who are passionate and enthusiastic. There are, of course, filmmakers who willingly embrace the often dismal commercialism and synthetic filmmaking that seems to dominate Hollywood. And there are others who are deeply cynical or bitter in their attitudes, defeated by the obstacles that challenge anyone who seeks to preserve their sense of integrity in a world of bottom-line thinking. Although all our filmmakers have had their share of frustrations, doubts and disappointments, by and large they are role models for the possibility of establishing successful careers, in many cases entirely within the Hollywood mainstream, while keeping to the priorities of artistry and authenticity. Indeed, central to this book is the belief that developing one's creativity can be both personally satisfying and at the same time a practical means to professional success. In our experience and observations, even the most mainstream parts of the entertainment industry are hungry for people who are genuinely creative. Once hired, it's true, such people are likely to encounter pressure to be more formulaic and clichéd. But the more they have learned to work from their own distinctive taste and point of view, the better they will be able to hold on to those qualities through all the stages and pressures of the production process. And when fresh, innovative filmmaking does reach the theatrical or television screen, it usually makes the responsible filmmakers very much in demand. Although we are coauthoring this book as longtime friends and teaching colleagues, we are three quite different individuals and have our own points of view and distinct professional filmmaking experiences to draw on: Carroll in independent feature filmmaking, Doe in media designed to promote and encourage social change in developing countries, and Jed in behind-the-scenes programs about Hollywood productions. Because all our varied experiences as filmmakers, teachers, workshop leaders and in our personal lives have shaped our views, we try to reference in the book what we have individually observed and learned. It is a challenge to have three authors and yet write in the personal tone we prefer. We try, in effect, to become three additional "characters" -- Carroll, Doe and Jed -- in this story of creative filmmaking from the inside out, mixing our own examples with those of the filmmakers we interviewed in the pages to follow. Norman Lear If I were a film or television student starting out, it's the book I'd want to read, because it tells you to create from your gut and your heart and your spirit. Victoria Riskin screenwriter and President of the Writers Guild of America, west Indispensable reading for students and professionals alike. George Stoney Professor of Film and Television, Tisch School of the Arts, New York University Creative Filmmaking is entirely fresh and different and welcomed. William McDonald Head of Production, UCLA Department of Film, Television and Digital Media In Creative Filmmaking from the Inside Out, the authors have stunningly codified an elusive process media educators must attempt to articulate every day in every classroom. This practical, illuminating and inspiring book will become a foundation text in film schools around the world.